Update: This contest is now finished. See the list of winners. I'm excited to announce the release of Regular Expressions Cookbook 2nd Edition, which I wrote together with regex superguru Jan Goyvaerts. It has actually been available as an ebook for a couple weeks on oreilly.com, but as of now, it is also in stock on amazon.com. The book tackles hundreds of real-world regular expression tasks in a problem, solution, discussion format. There's also a detailed regular expression tutorial included, in the same format. Check out Jeff Atwood's and Ben Nadel's reviews of the first edition, which have more details about this. Update: Rob Friesel Jr. posted an awesome, detailed review of the second edition. The first edition was a bestseller, and is now available in eight languages. It briefly held Amazon's #1 spot for computer books upon its release in mid 2009, and the ebook version was O'Reilly's top seller of 2010. What has changed with this new edition? The second edition adds more content, and updates existing chapters. There are innumerable improvements, including the most noticeable addition of a new chapter written by Jan, titled Source Code and Log Files, and various new recipes interspersed with four of the other chapters. There are 101 new pages in the second edition, and that's after shortening and removing some content from the first edition. There were 125 recipes in the first edition, upped to 146 in the second. Note that many of the book's recipes provide solutions and in-depth discussions for more than one problem. Tons of changes, ranging from minor copyedits and errata corrections to major revisions and the addition of significant new content, were made throughout the existing content. Everything was brought up to date with the latest standards, tools, and programming language versions. In particular, updates to Java and Perl since the first edition brought very significant regular expression changes. Plus, we've covered some advanced regular expression features that already existed the last time around, but didn't make it into the first edition. What will interest long-term fans the most? Even though there are lots of important changes throughout the book, the new recipes and the updated coverage for the latest programming languages are probably the main reasons for owners of the first edition to upgrade. The fully-new recipes cover creating a regex-based parser, validating password complexity, adding thousands separators to numbers, matching various kinds of numbers, decoding XML entities, and everything in the new Source Code and Log Files chapter. The coverage of XRegExp is also completely new in the second edition. What will cause readers to trip over themselves in their haste to buy a copy? If you read though the book, you'll learn about a lot of things—much more than just regular expressions. You'll almost certainly learn something new about Unicode, phone numbers, and XML, as just a few examples. You'll learn that the eighth floor of the Saks Fifth Avenue store in New York City has its own ZIP code, which also happens to be the only ZIP code that includes letters. You'll learn that the Chicago Manual of Style and Merriam-Webster's Biographical Dictionary disagree on the correct alphabetical listing of the name Charles de Gaulle (my girlfriend and I are in opposing camps). Jan and I put a ton of research into the book, and we pay attention to details. I think that shines through. Oh yeah, and along the way, you'll also become a Master Chef of regular expressions, able to slice and dice text with the best of them. But not everyone will want to actually read through the book. Some readers will prefer to take advantage of the cookbook format and read only the parts that solve their immediate problems. That's fine, too. Many developers complain that they're continually relearning regular expressions, going back to the reference documents every time they need to write a new regex. 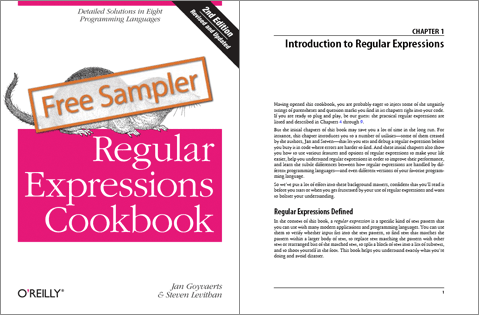 The problem/solution approach of Regular Expressions Cookbook means you learn by doing, and we think that helps the details stick with you more securely than with the other books and websites out there. Many regex novices turn to Google to get prewritten regexes that solve their problems. Unfortunately, if you're not already fluent in regex, you won't realize that 90% of the regexes out there have some kind of problem, be it returning false positives or negatives, performing inefficiently (or maybe even crashing your server when fed malicious data), being more complicated than necessary, not being portable, or what have you. When you use the regexes in Regular Expressions Cookbook, not only do you get detailed coverage of all the related issues (which helps you customize the solution, if necessary), you also get the peace of mind that you're using proven solutions by real subject-matter experts. So how do I enter to win a free copy? Simply comment on this blog post on or before 11:59 PM EDT on September 7th, and you'll be in the running. I wish I could leave the contest open a bit longer, but I'll be moving to California to work for a little Internet startup. You'll need to use your actual first and last name and email address with your comment. Names are published, but email addresses are not. Each person commenting has only one chance to win, regardless of how many comments they post. If you don't know what to write in your comment, just mention whether you'd prefer a print or ebook copy. Shortly after this contest ends, I'll randomly choose 15 winners and contact them by email. If you prefer a printed copy, I'll be asking for your address and, if you're outside of the U.S., your phone number. O'Reilly will pay for shipping to anywhere in the world. Good luck! Coauthor Jan Goyvaerts has written up his own summary of the changes in What's New in The Second Edition of Regular Expressions Cookbook. Follow me on Twitter @slevithan or on GitHub at slevithan. Time to dive into regex! Help me improve my regex! Good Luck! Love your book! Beeing a student working with perl scripts – I could really use this great book to deepen my insights in regex! I’d be glad to have one. Doing regular expression work, so would be great if I could get a printed copy of the book. I would love to have one copy please. It will really help in my current project. Please put me in the drawing for an eBook version. thanks. I learned rudimentary regex skills early in the ’90s. I don’t think a week goes by where I pull some magic regex shortcut out of my skills hat. I’m really looking forward to expanding my skills with thev2nd edition of the Cookbook. I love this http://www.regexpal.com/ web for writing data provider files for matching billing page. If i got this free Book i am very happy to read and give suggestion also. I would like to try for a free copy. by date I think I’m out, but http://regexpal.com/ site mentioned today is the last day.. I need an ebook copy.